If you’ve got more than a few items or categories in your online store, filtered navigation is a must to help shoppers find what they need. And now you can add product filters to your Ecwid storefront — out of the box. Let customers filter your products by size, color, categories, price, brand, availability in stock, special offers and so much more — and then watch your sales grow. As fans of automation, we’ve put a smart algorithm behind our product filters to allow you to set yours up in minutes with personalized recommendations, no matter how big your catalog is. Make sure you’re on a Business or Unlimited pricing plan. Enable Next-Gen Storefront in Control panel → Settings → What’s New. If you don’t see this option, your store is already prepared to enable filters and you can skip this step. Go to Control panel → Settings → Product Filters and click Enable. Enabled filters will appear on the storefront. And that’s it! If you decide you want to add some filters of your own, keep reading for our easy step-by-step process. If you have a sale price or stock level set up, you’ll be able to enable filtering On sale products and those available in stock. If you’ve set up common Product Options (for example, size and color) for some of your products, you’ll see a filter by specific product options. Product Types are groups of products that share the same attributes. In an online bookstore, there might be books with paper covers and books with hard covers. The Attribute Cover can become a filter criteria. Search by Phrase ensures quick product search if a customer already knows exactly what they’re looking for. Based on your store’s data, you’ll see a list of suggested filters in your Ecwid Control panel to select. The more products in your catalog that share a filter criteria, the higher it appears on your list of suggestions. If you don’t see the desired filter at this point, create a new Attribute in your Ecwid Control Panel → Settings → Product Types, and add those values to your products in Catalog → Product → Attributes. Filtered navigation is a way to narrow and streamline product search that may help your customers discover and find your products. This сan improve their shopping experience, which ultimately serves to help you sell more. Using navigation filters should lead your shoppers to the specific products they want. If you have over 50 products that come in different sizes, colors, or styles, you should include those criteria in filtered navigation. Stores with fewer products can do well with a simple categories navigation and a search box, though that may depend on the specific products being sold, so don’t hesitate to test navigation filters in your online shop. When a customer visits one of your store categories, they can click Refine By and use navigation filters to sort products from that category only. This keeps your customer focused. When product filters are on, the search page becomes a product feed that displays all store products. 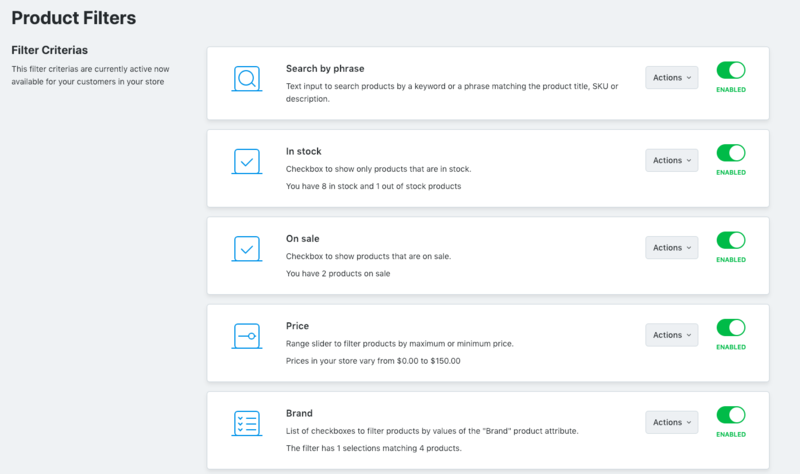 Your customers can use filters here to sort items they’re looking for and discover more products. Customers can access this page via the link in the footer (look for All products), and you can also link to this page throughout your website using custom banners or simple links. Add categories and subcategories to showcase your product line and help customers navigate from your homepage to specific groups of goods. Add a menu widget to the website/store header or use the Multi-level Store Menu app. Add an Ecwid search box to any page on your website — or every page to make it more visible. Link your Ecwid search page in the site menu for quick access to all products with filters. Add featured products to your homepage to promote your new arrivals and top-selling items or to sell out old stock. Add Buy Now buttons to sell your products in-context on your blog and other pages. Big companies spend millions every year improving website navigations and user experiences. And if you’re serious about your e-commerce store, improving user experience should be at the top of your list too. Fortunately, you won’t need to spend millions to deliver an amazing user experience for your customers. Here at Ecwid, we make great UX accessible with proven and trusted technologies that deliver convenient e-commerce navigation tools to businesses of any size. 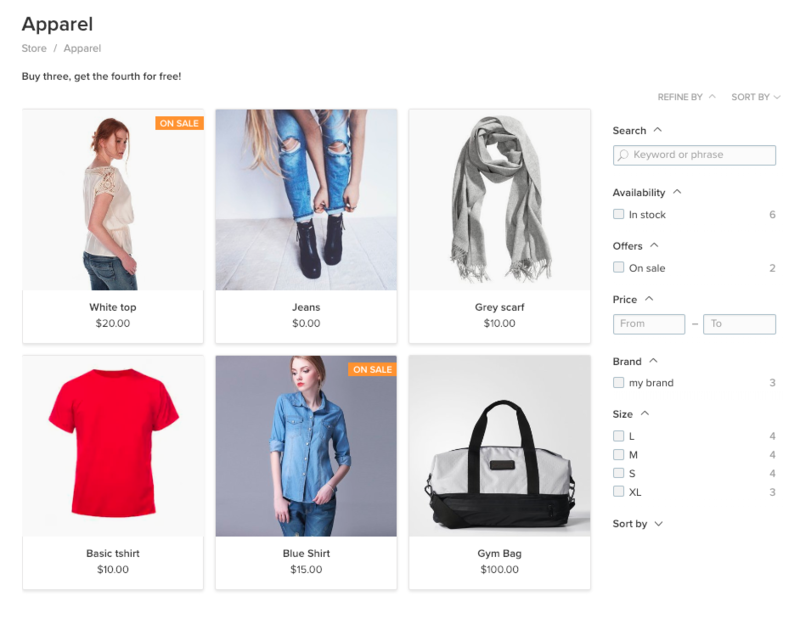 With Ecwid’s revamped product grid and dozens of design options, your storefront will look stunning and flatter your products right out of the box. Refreshed and customizable product pages allow you to tweak and test different layouts without coding. And our optimized one-page checkout streamlines purchases and reduces bounce rates. So be sure to stay up-to-date on the latest Ecwid features, try them in your store, and don’t forget to let us know what you think!